Professor Said Elghobashi, Ph.D., D.Sc., Department of Mechanical and Aerospace Engineering, is researching the two-way interactions between vaporizing droplets and turbulent flows using fully resolved, direct numerical simulation (DNS). The study is of particular relevance to liquid fuel spray combustion that is the predominant energy source in transportation systems. His main objective is to understand the effect of turbulence on the rate of droplet vaporization, which is the main controlling mechanism of the entire combustion process, as well as the effect of droplets on turbulence. Turbulent flows laden with inertial particles (solid or liquid) are ubiquitous in nature (e.g. aerosols in clouds and dust storms) and in industrial applications (e.g. liquid fuel and pulverized coal sprays in combustion chambers). Experimental and numerical studies of these flows are quite challenging, due to the wide spectra of length- and time-scales of the dispersed particles, in addition to the spectra of scales intrinsic to the carrier fluid turbulence. Due to the limited memory and speed of current and near-future parallel supercomputers, it is not expected that DNS will be able to predict engineering flows in complex geometries in the foreseeable future. 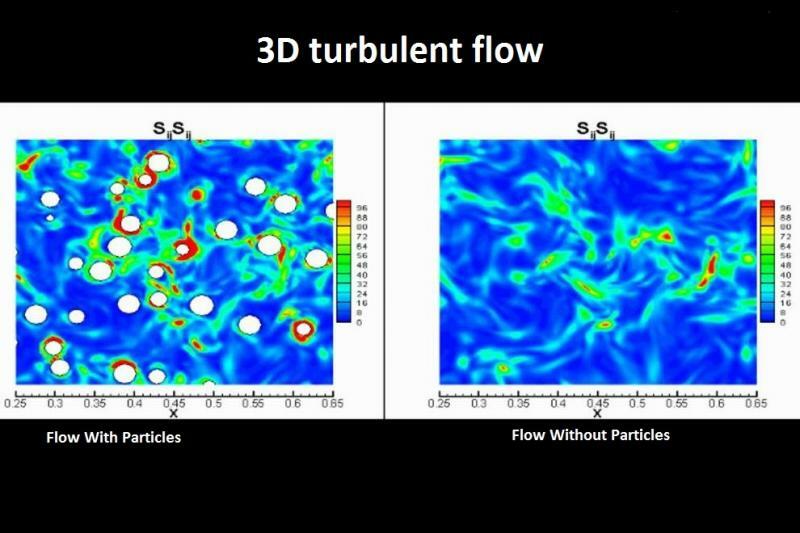 However, DNS remains the only numerical method that can provide new physical insights at all scales of turbulence in flows involving complex physical phenomena such as chemically reacting or particle-laden turbulent flows. As the capabilities of parallel computing expand, DNS will be more widely used in scientific studies of complex physical phenomena in simple geometries. The research on vaporizing droplets is supported by the National Science Foundation (NSF) and U.S. Department of Energy (DOE). The NSF project is a combined numerical/experimental study with the experiment conducted by Professor Derek Dunn-Rankin, Ph.D., Department of Mechanical and Aerospace Engineering. In August 2011, Elghobashi was awarded 10 million processor hours of computing time on the Petascale computer (Intrepid) at the Argonne Leadership Computing Facility (ALCF) through the DOE’s Advanced Scientific Computing Research (ASCR) Leadership Computing Challenge (ALCC) to conduct further research. In October 2011, Elghobashi received a second award from DOE, the 2012 Innovative and Novel Computational Impact on Theory and Experiment (INCITE) Award, for 20 million processor hours on Intrepid. A typical DNS run of a few thousand, freely moving, vaporizing droplets in a turbulent flow can require up to 100 hours on 65,000 parallel processors on Intrepid. Elghobashi earned his M.S. from the University of Southern California in 1971, and his Ph.D. and D.Sc. from Imperial College, University of London in 1974 and 1999, respectively. He is a Fellow of the American Physical Society, the American Association for the Advancement of Science and the American Society of Mechanical Engineers.